When we remodeled our house 3 years ago, we created a very open floor plan on our main living level by removing a wall. So now we have our kitchen, dining area (it isn’t a formal dining room as we never used one), and living room all together. This has worked out well, but during the planning stages, we realized that there would be a slight issue and that is based on how we wanted our couches, there would be no walls around them to plug in a lamp, charge devices, etc. We decided to put an outlet in the floor (the concrete had to be cut to put in the outlet which was being done anyway for our kitchen island). This outlet turned out to be a great decision. We started by plugging in a lamp into the outlet (the lamp is less harsh than the overhead lights) and then when I added a 5.1 surround system, I plugged the wireless subwoofer/rear speakers into the outlet. 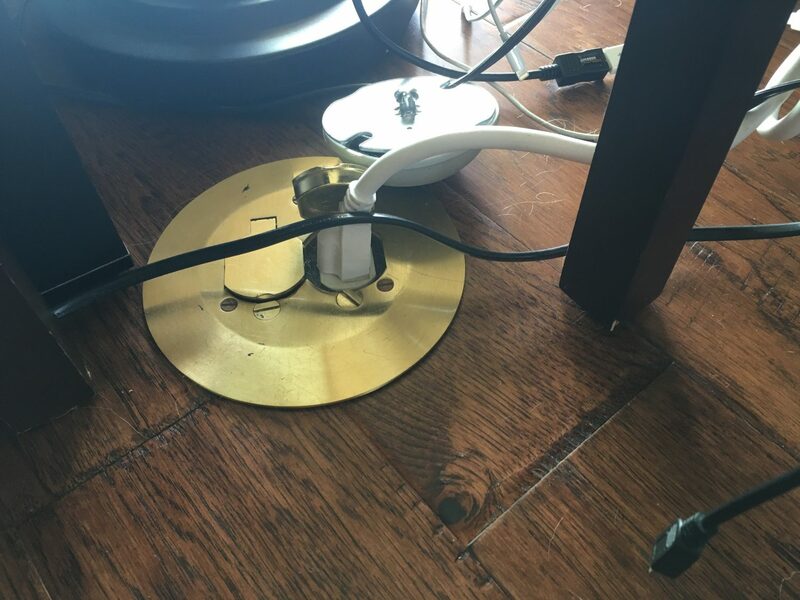 Of course, we only put a duplex outlet into the floor so when my wife wanted to charge her iPad there (she tends to use it most while sitting on the couch), I dug out a Y outlet and used that. One device turned into 2 and then turned into more where we had to keep swapping out the cable. After purchasing a few of the Anker 5-Port USB Charger PowerPorts, I thought that using one of these on a table near the couch would solve my problem. 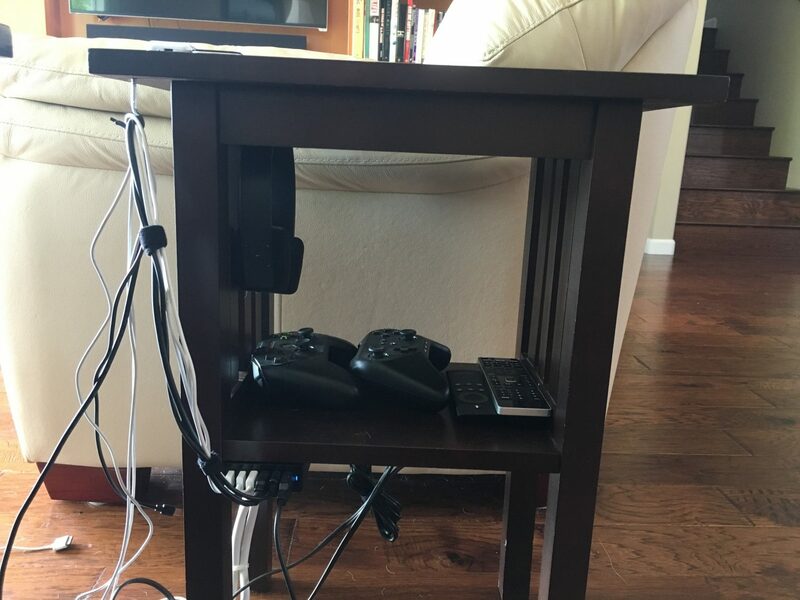 So I bought a small power strip, used industrial strength Velcro to mount it under an end table, and then mounted an Anker 6-Port USB Charger PowerPort under the table as well. Now I had 6 USB ports easily accessible near the couches. I quickly realized that this solution was ingenious, if I do say so myself! It turns out we have a bunch of devices that occasionally need charging including an Apple TV Remote, a SteelSeries gaming controller, an Aeon Labs Z-Wave remote, an iPhone used as an automation remote, a pair of Bluetooth headphones that I sometimes use with the TV, and a few iPads. I’ve plugged in 2 30-pin cables, 2 lightning cables, a micro USB cable, and a mini USB cable into the Anker. This lets me easily grab a cable and be able to charge anything. I’m still not quite sure what to do with the cables, but for now they’re all hanging together. There are several different systems on the market for doing automation and I chose a Z-Wave based system called VeraLite. I went with Z-Wave over Zigbee because there is more variety in types of devices and liked that there were more manufacturers of devices than with Insteon. VeraLite is kind of a hacker’s box for automation. It runs Linux, has an active community, and allows people to create plugins in Lua. I selected Leviton Vizia RF+ components for my switches, controllers, and outlets. I liked the styling of them and they go with the rest of the normal switches in the house. I have a bunch of them and getting everything to work has been a bit of a challenge. The controllers are kind of wacky and I’m still working out the kinks; apparently Z-Wave allows proprietary extensions in the protocol and the Leviton devices do this; VeraLite doesn’t understand all of it. In addition, the mesh network that Z-Wave creates for everything to talk to each other seems to get confused a bit. I’ve gone through the “heal” process more times than I care to count and now everything seems stable. My house is just over 1600 square feet on 3 levels (it is a tri-level), so I’d expect the mesh network to work fine. Each level has a number of devices that act as repeaters and the main controller is located on the bottom level pretty much in the center of the house. So now that I have it setup, what next? That’s a good question. I’ve setup a few “scenes” that are pretty simple. For instance, I have the front outside lights come on when motion is detected at night (the motion sensors are not Z-Wave sensors, but hooked into a security system as I thought it would be more reliable and didn’t require batteries for every sensor) and then they turn off after a few minutes. I have another scene setup that turns off the bathroom lights after 15 minutes if there is no motion; my wife has a bad habit of leaving the lights on which drives me crazy. I have a couple of other scenes for turning equipment off at night to reduce power consumption. I know I’ve only scratched the surface, but I think it will be worth it in the long run. Since I’m not content to leave well enough alone, today I worked on a plugin for Vera (I based it on someone else’s work, but stripped a lot of it as my needs were different) that talks to my audio control units. So now, I can turn music on in any room of the house from Vera’s web interface without having to get up and push the button on the wall. Some may think I’m quite lazy (OK, maybe I am), but this is going to be useful when we want to turn on music outside as my (somewhat) poor planning put the audio controls in awkward places for the outside. I know that many companies are trying to bring home automation to the masses. I’ll be watching to see how they do in the market. The concept is great, but it is really hard to make a one size fits all system that is extremely flexible. Without the flexibility, I think automation systems will be hampered. If I wasn’t a geek and a developer, I don’t think I’d touch automation at all; it just isn’t ready for the average consumer. Over a year ago, my wife and I decided to sell our house and move closer to the water. We expected to be in a rental for maybe 6 months before finding a house. We were fully prepared to wait and wanted a fixer. Unfortunately, the real estate market here in San Diego started heating up again and finding a house was not an easy task. We had a few requirements for a house, but looking back, we were actually flexible on some of those requirements. 11 months and offers on 6 houses later, we finally found the house that we’ll eventually call home. I say eventually because we have a very large remodeling project. While a lot of the remodeling is interior and cosmetic, we are filling in a pool (yes, people think we’re crazy, but having had a pool for 8 years where it was warmer than where are are now and not using it much, we’ve decided that it isn’t worth keeping), removing a fireplace (switching to a gas appliance fireplace), rearranging some rooms a little, adding some closets, and fixing up the kitchen. This project is going to take awhile and while we’re very anxious to get moved in, I’m sure the time will start flying by as the process gets underway. Of course we want it done right the first time, so we’re not going to rush it. I’m not quite sure how most people go about remodeling a house as there seem to be lots of hurdles and pitfalls. Luckily, I have a construction expert (my father), who has offered to oversee the work and guide me. My wife has been complaining that the temperature on our thermostat is always wrong, reading too high. So, I’ve looked a few times at getting a replacement thermostat. However, since they cost $60-$70 for a regular programmable one, I’ve put it off until I did my research to find one that I liked. My biggest complaint about the thermostat was that programming it was a pain; we’re currently on the same routine 7 days a week as our son wakes up at the same time and goes to bed at the same time, so if I want to change the temperature or time, I need to copy the program across all 7 days. While not complicated, I don’t like the interface for doing it. A friend of mine said he got a Radio Thermostat CT30 WiFi enabled thermostat. It sounded quite gimicky as who really needs to control the temperature sitting on the couch? I saw that the price was $99, so it was almost a no brainer to get it. For only $30-$40 more, I could get a new toy! This device is the same as the 3M Filtrete 50 which Home Depot apparently sells. I went to my local Home Depot and it had a spot on the shelf, but no units. A stock check showed no units in the county and none on order. Very strange. Anyway, I ordered it on a Saturday and it arrived the following Thursday. Before installing it, I read all the instructions online and it looked like I was good to go; I just had to hook up an extra wire at my furnace and connect it to the thermostat for power (the C wire). After finally figuring out which circuit my furnace was on, I turned off the power, hooked up the thermostat, fought with it to mount it (the wire in the wall wasn’t moving back into the wall for me to mount it flush), and turned the circuit breaker back on. 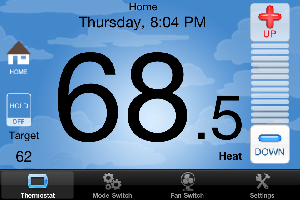 A few minutes later, I was able to control the thermostat with my iPhone. That was very, very cool. One thing that concerned me, however, was that the A/C compressor was making a clicking noise. I shut the power off again and was about to yank out the thermostat when I decided to try wiring the C wire different; this time I wired it to an unused lead on the furnace, not the C lead. It still provided 24 V AC, but wasn’t touching the compressor’s wires. This seemed to have solved the issue for me. Hopefully I didn’t blow up the relay for the compressor. First thing I noticed is that the temperature read 3-4 degrees cooler than our old thermostat, so the new one actually did solve one problem. After poking around at the Radio Thermostat account page, I found out that I could quickly and easily program the thermostat from a web page. Another win! The thermostat pings a server every minute to update status and get new commands. This, of course, brings up the question of what happens when the company goes out of business. I have no idea, but the thermostat does have an internal web server so I could likely control it locally if needed. Besides being able to set the current temperature while sitting on the couch, another win for the thermostat is being able to set the temperature when I’m not home. If I forget to hold the temperature so it doesn’t come on when we’re not home, I can use my iPhone and do that. In addition, I can change the temperature before I get home. 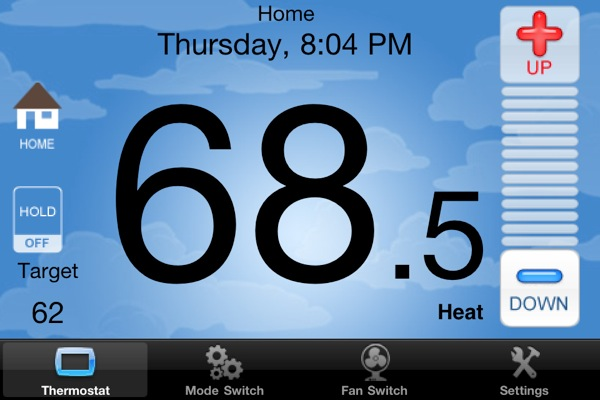 Nice iPhone/iPad application to control temperature. Programming can be done on a web site. Temperature can be set remotely. Large, easy to read touchscreen LCD. Price is a little more than a regular, programmable thermostat. Installation can be quite tricky. I’m not sure why I am so excited about a thermostat, but this is just too cool. Being able to control the temperature when I’m not home is very neat and being able to do the programming in seconds without having to consult the manual is very handy. If you know how to install a thermostat and know how to work with WiFi access points, this thermostat is a must get! Will there be better devices that do more coming soon? Of course, but if you are looking to replace your current thermostat, this is a no brainer. Install this device at your own risk; I take no responsibility for any issues that may arise from installing this device. On Friday, I decided to work on our irrigation system as I had a few more things to finish up since our main plumbing problem of last month. While I was finishing the plumbing, I decided to replace the fill valve for our pool with an electronically controlled, sprinkler valve. I already had an anti-siphon device, so I just needed the valve. The old valve leaked and I had to manually remember to shut it off. I went to unscrew the old valve and as I was doing it, the valve started turning where it shouldn’t. I then realized that I had a problem. Oh no, another call to a plumber. I called my dad and he said to call my brother-in-law who had tools to do plumbing work. My brother-in-law, Chris, came over and tried to solder a cap in the line. Chris is an attorney, not a plumber, so he did his best. Unfortunately his work didn’t hold and I was all set to call a plumber when my wife, Janessa, said that she wanted to take a crack at it. She does jewelry work and has soldered before. We left her alone and she soldered away. When I came back, she had finished the first joint and then started on the second joint. She finished, when tested it and bingo, it worked! The only reason I hesitated in letting her take a crack at it in the first place is that she had never worked with plumbing or pipes before. However, soldering is soldering. I shouldn’t have doubted her skills. Janessa might reject her soldering as now I can task her with tricky household maintenance work :-). I searched for the part to eliminate the hum from my stereo, but all I could find online was one for $10 + $7 shipping. So, I called my cable company to see if they’d come install one for me. They told me to Radio Shack and get a Ground Loop Isolator. I did, hooked it up, and the hum is mostly gone. It’s still there when the volume is cranked up real loud, but that could be something else. Very nice. My wife and I have noticed a hum in our whole house audio system and today I finally decided to do a web search and see what came up for fixing it. I found an article which indicated that any component hooked up to cable TV could cause the problem. This sounded far fetched to me, but what do I know about audio and intereference? So, I disconnected all but the MP3 player and the hum went away. I plugged in each source until I got to the TiVo/TV. When I got to the TiVo/TV (it’s on a switch), the hum came back. So, I disconnected the cable and what do you know? The hum was almost eliminated! Now I’m off to the store to look for an isolator to fix the problem. I learn something new everyday. Well, all my sound isolation stuff worked pretty poorly and I was a bit annoyed at the noise. I decided to take another stab at it and read reviews that the Antec cases were pretty good and quiet. I bought a Sonata II from NewEgg that arrived yesterday. I removed my computer from the old case this morning and put it in the Antec. I powered it up and was amazed at how much quieter my server is. The new case cost $99 + tax and shipping; the old one was about $60; the $40 difference is quite remarkable. When I got the server in the first place, I said I wanted a quiet case, not knowing a whole lot about build your own computers, I let Chip Merchant pick a case. That sure was a mistake and I won’t repeat that one. The Antec case is well built and everything fits together well. The cheap case I had before came with no instructions and was extremely bare bones. Too bad I had to go through the process of swapping cases and hearing my machine for a month. In one room of our house, which was an addition to the main house, we have an electric, in-wall heater. We never really cared about using it as we haven’t had guests in the winter. Well this morning I turned it on to see what would happen as my in-laws are coming for Thanksgiving. The heater turned on for about 30 seconds and then shut off. I fiddled with the knob and it worked for another 30 seconds. So, being the good engineer I am, I shut off the circuit breaker, and disassembled it so that I can get the parts tomorrow. I had the main piece (the thermostat) on the counter (it’s a 30 year old heater, so it is pretty simple) and explained to my wife how it works. See tells me to try moving the thermocouple away from the heater (it was sitting in front of the heating element). I didn’t really think it would make a difference, but said OK, put it back together, moved the thermocouple, turned on the circuit breaker and gave it a whirl. Well, it worked and the room started heating up (slowly, but surely). I’m not sure why I didn’t think of that “fix” as I’m an engineer and knew exactly how the system worked. So simple and my wife proved that it doesn’t take an engineer to solve a problem. I finally managed to finish patching and painting the holes created when the wires were pulled. Another project complete and now I can spend my time doing something else, maybe play video games for awhile.